Cisco collaboration solutions are trusted world-wide for their quality and security, driving operations in organizations of all types. Cisco provides reliable, leading-edge, secure technologies—from business collaboration solutions to Cisco IP video surveillance—in highly technical environments such as education, healthcare, transportation, and energy. As the world’s largest and most trusted AV integrator, AVI-SPL partners with innovative communication technology manufacturers—like Cisco—to give you access to the most advanced, secure, and effective AV and collaboration solutions. Our commitment to excellence is reflected in the expertise of our technicians and engineers; The AVI-SPL team holds over 18 Cisco certifications of specialization and partnership. Cisco Webex Teams allows for cloud-based messaging, presence, meetings, and calls. The app allows you to start calls from your smart phone or tablet with just one tap; or use the Cisco Webex Board, which enhances meetings with a touch-based, all-in-one collaboration board that empowers your team to share documents and drawings in 4K. Moffitt Cancer Center uses Cisco’s cloud-based Collaboration Meeting Room to improve and simplify collaboration among its doctors, staff, and affiliates. Cisco video conferencing systems connect each restaurant, allowing executives to collaborate over video for internal meetings, while chefs and hosts use it to train other locations at the same time on new menu items and software upgrades. Cisco Digital Media Players in 72 classrooms throughout the district facilitate digital signage, IPTV and over-the-air broadcast TV. Additional digital signage displays and media players in areas outside the classroom, such as lobbies and hallways, were added to deliver news, event information and wayfinding assistance. Cisco Show and Share, which the client relabeled “Moffitt on Demand,” enables Moffitt to share its library of videos with patients and staff over the campus network, as well as with other hospitals and specialists on the public Internet. 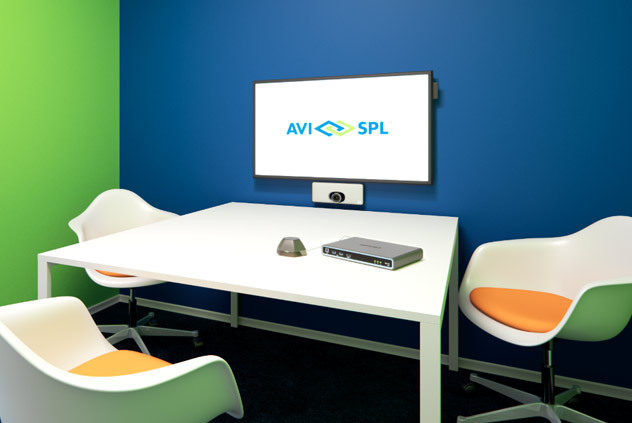 AVI-SPL and Cisco work together to create flexible meeting spaces for every team. The Cisco family of offerings makes it easy to select the solution that best fits your business needs, team composition and available physical space to get your team connected and synced. The Cisco Webex DX80 is the all-in-one desktop collaboration featuring High-Definition (HD) video, unified communications features, a display for your laptop, and expanded capabilities. Cisco Meeting Server brings video, audio, and web communication together to meet the collaboration needs of the modern workplace. Cisco Webex Board is an all-in-one device that provides everything you need to collaborate with your teams in physical meeting rooms. Cisco Webex Room 70 delivers the unmatched video and audio experience customers have come to expect from Cisco. Cisco Webex Teams puts all of your business collaboration needs – content sharing, annotating, and videoconferencing – in one tool. Today’s meeting room must be flexible to offer a variety of ways to access multiple streams of data and fully engage with your team. The user experience must be seamless for all participants.